At a recent conference I found that the poster presentations were the most engaging way of understanding the work done in AI (artificial intelligence) and education. How do you remember as much information as possible from all the different sessions at a conference like AIED 2018? Image by Pravin Chopade via Twitter. 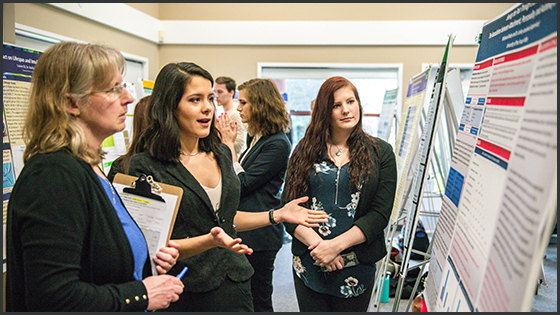 In poster sessions it is easy to interact with researchers directly and engage with their work actively. Image by the University of Fraser Valley via Flickr. 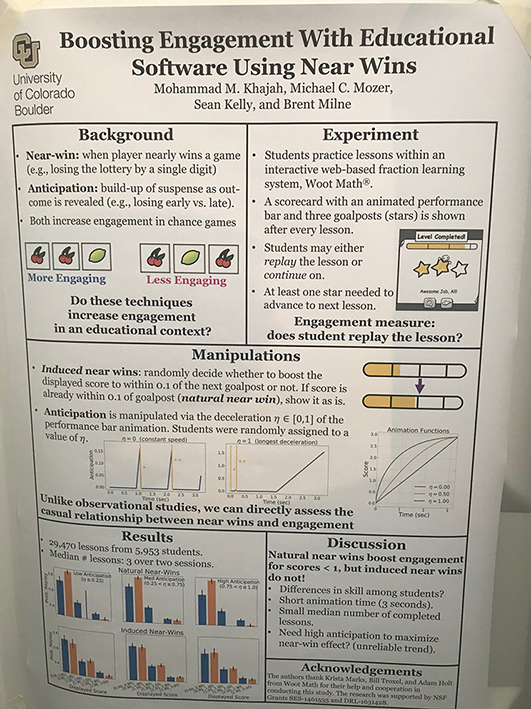 Take a closer look at the poster on 'Boosting engagement with educational software using near wins' that stood out to me. The near-win effect occurs when an individual comes close to achieving a goal, while anticipation refers to the build-up of suspense as an outcome is revealed (e.g., losing early vs. late). Gambling psychologists have long studied how near-wins affect engagement in pure-chance games but it is difficult to do the same in an educational context where outcomes are based on skill. Efficient navigation in learning materials: an empirical study on the linking process. 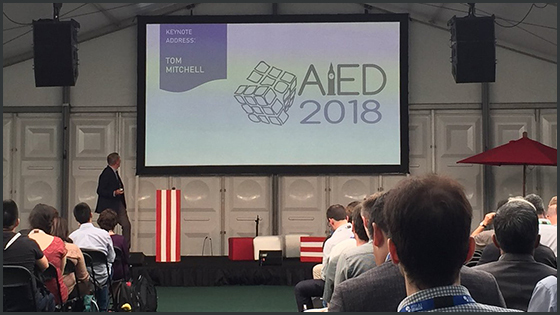 AIED 2018 (Artificial Intelligence in Education) conference at the University College London, and on Twitter. Boosting Engagement With Educational Software Using Near Wins [pdf], Mohammad M. Khajah (Kuwait Institute for Scientific Research, University of Colorado Boulder, CO, USA), Michael C. Mozer (University of Colorado Boulder, CO, USA), Sean Kelly (Woot Math Inc., CO, USA), and Brent Milne (Woot Math Inc., CO, USA). Would you like to learn more about AI in education? Find the Conference proceedings from AIED 2018 online. You can book a meeting with a learning technologist to help you evaluate and implement tools, such as AI, in your teaching and learning. Have you seen AI being used for teaching and learning at Oxford? Let us know in the comments.